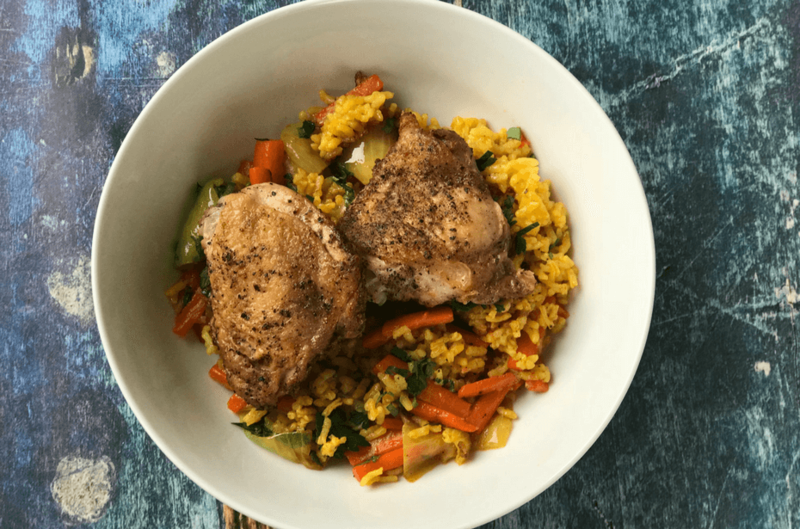 Arroz con pollo is my comfort food. 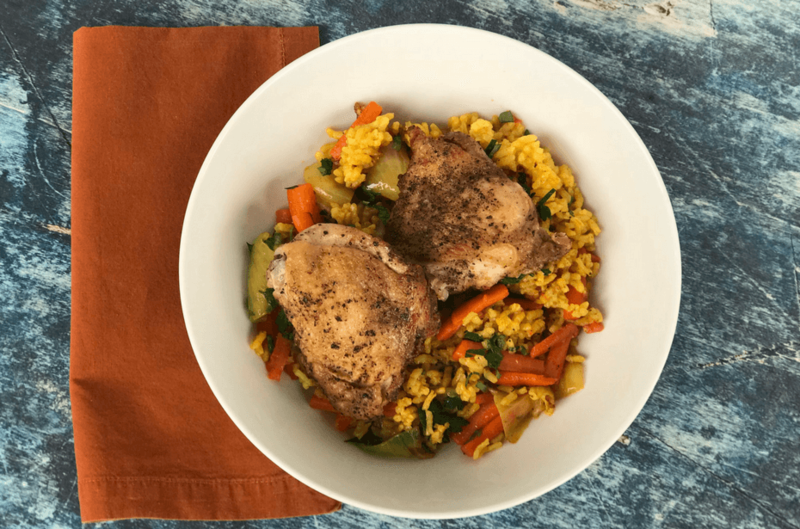 My mother made it often, and the combination of chicken, rice and veggies with bold spices evokes such wonderful memories. The scent of cumin alone takes me back to my childhood kitchen with my mom standing at the stovetop – wooden spoon in hand, warm smile on her face. 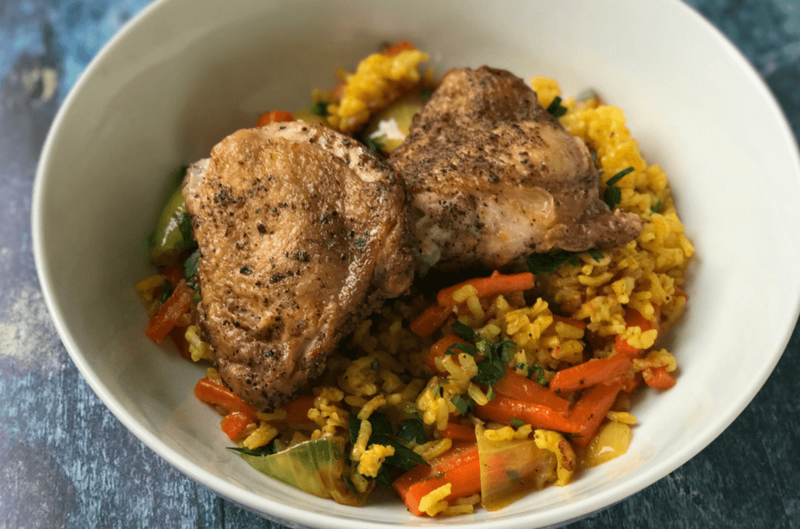 Arroz con pollo was the dish she made not just to feed our family and put something on the table, but to nourish us. And, for some reason, it just made us feel better. I suppose this is what food is love is all about. This isn’t my mom’s recipe. Sadly, I never thought to learn it as a kid or ask her to share it until recently, and Alzheimer’s has made it too late to ask. Too late to ask so many things. But I think my beloved mom would love this recipe, too. The rice is colorful like hers, the carrots firm-tender, and the reaction from my family, instant love. Sean said this is the best rice dish I’ve ever made so maybe I was paying attention to my mom after all. One thing that is different in her recipe is the chicken. My mom used to cook her chicken in the rice. Here, the chicken is browned in a pan and added back to the rice and veggies later. It works just as well, if not better. Also, my mom didn’t add herbs – and I throw in a generous amount of cilantro and parsley and a touch of lemon juice after cooking. Not sure my mama would agree, but I love the final touch. I hope you and your family will enjoy this dish as much as hours. Buen provecho! 1 cup dry arborio rice or brown rice, cooked according to package directions. 2. If chicken is in the fridge, be sure it is brought to room temperature for an hour or at least 30 minutes. Pat dry with paper towels, and salt and pepper liberally. 3. In a large ovenproof sauté pan, heat oil on medium-high, until a drop of water sizzles on surface. 4. Place chicken thighs skin side down until well browned, about 8 minutes. Turn over and repeat on the other side (note: chicken thighs will be a bit crowded; it’s ok, as long as surface and especially skin is browned). 5. Remove chicken from pan and set on a plate lined with a paper towel to absorb grease. 6. Discard all but 1 Tablespoon of the oil in the sauté pan. Add the onion and carrots and salt and pepper. Cook until they begin to soften, about 5 minutes. 7. Add the paprika, cumin and turmeric and toss to coat well. Fold in the rice (you should fluff cooked rice with a fork before adding) and again, toss until rice and vegetables are well coated with the spices. Add more salt and pepper according to taste, if necessary. 8. Place the chicken on the rice, and cover the pan. 9. Place in the oven and cook for 15-20 minutes or until chicken reaches 160. 10. Remove pan from oven, and remove chicken from the pan once more (place on a clean plate). 11. Squeeze in juice from 1/2 lemon and add parsley and cilantro to the rice and veggie mix. 12. Serve rice and place chicken on top. This is another one of those dishes that's even better the next day. Enjoy the leftovers!